Cheap Trick – Sliding Blade Trimmer. Happy Thanksgiving to all in the US. My wish for you is that you enjoy your family and friends on this special day. Good family and friends, great food, and lots of love and laughter. After you have risen from your nap after the bountiful foods and drink have a look at this video I have created. 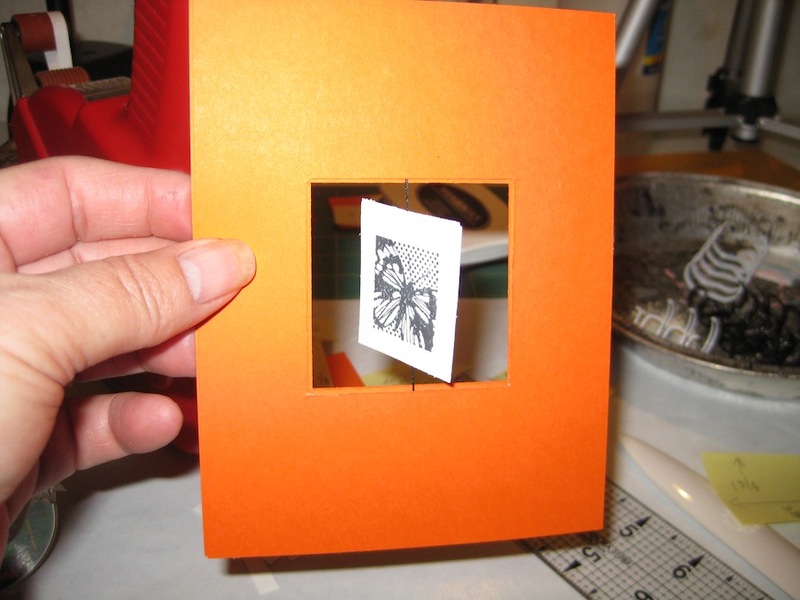 I show you how to use a budget priced paper trimmer to cut a square hole in the center of two A4 size (4-1/4 x 5-1/2) pieces of card stock. I show you how to get the scored frame around your cut. 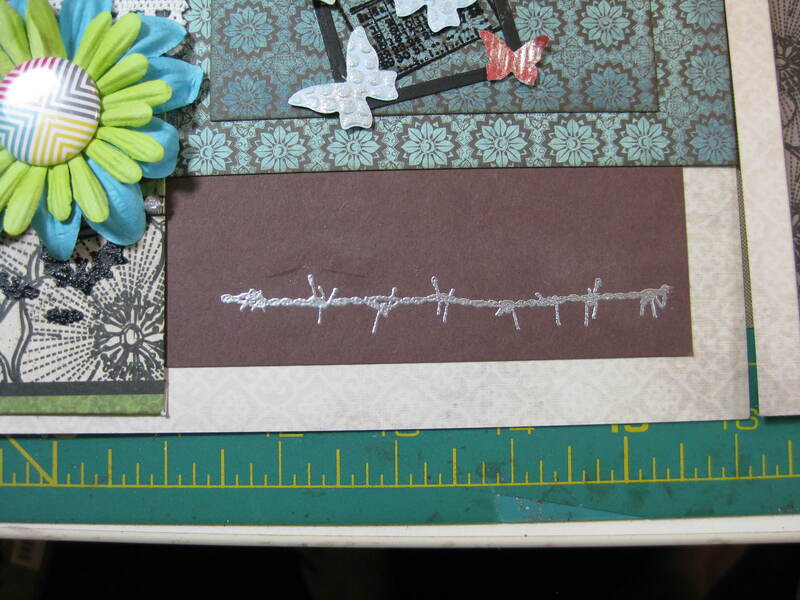 I also show you how to use the paper trimmer to score lines along the length of the card stock. 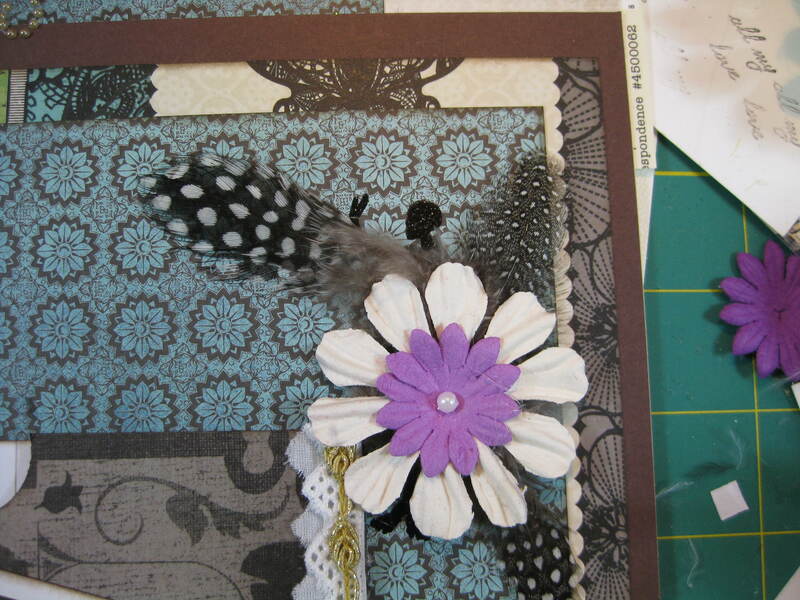 You will see, in the video, that I make a 2 inch square cut out on the card stock pieces. If you want a rectangle or larger square to feature one of your favorite stamped images or beautiful papers it will be easy for you to do. Find the center, which I show you the center measurements in the video. Measure your image or feature element. 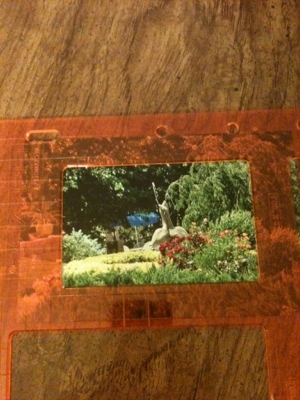 Say for example you have a stamped image that is 1-1/2 inches wide by 3 inches tall. 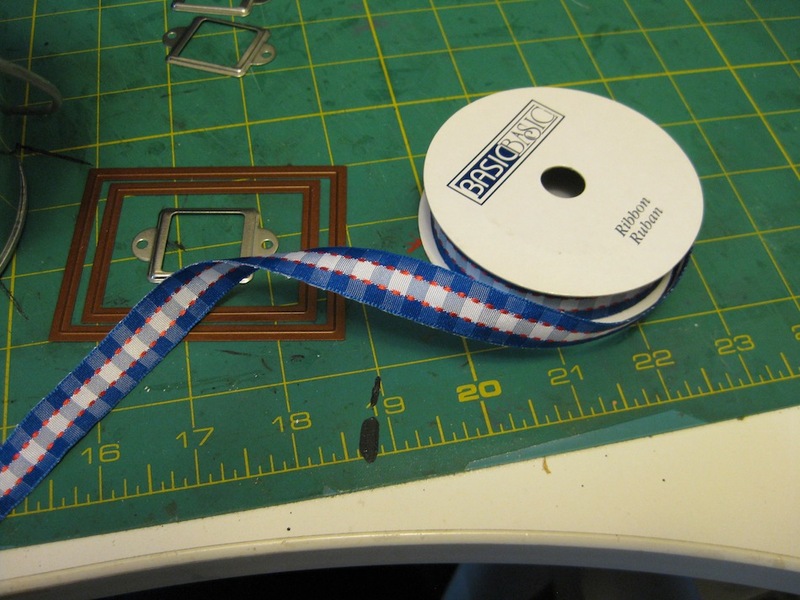 Add 1/2 inch to the measurements to be 2 inches wide and 3-1/2 inches tall. Your center line measurement will be 1 inch from the left of center and 1 inch from the right of center on the wide part. For the tall measurement you would be 1-5/8 inches from the top of center and 1-5/8 inches from the bottom of center. Have fun in your creativity. 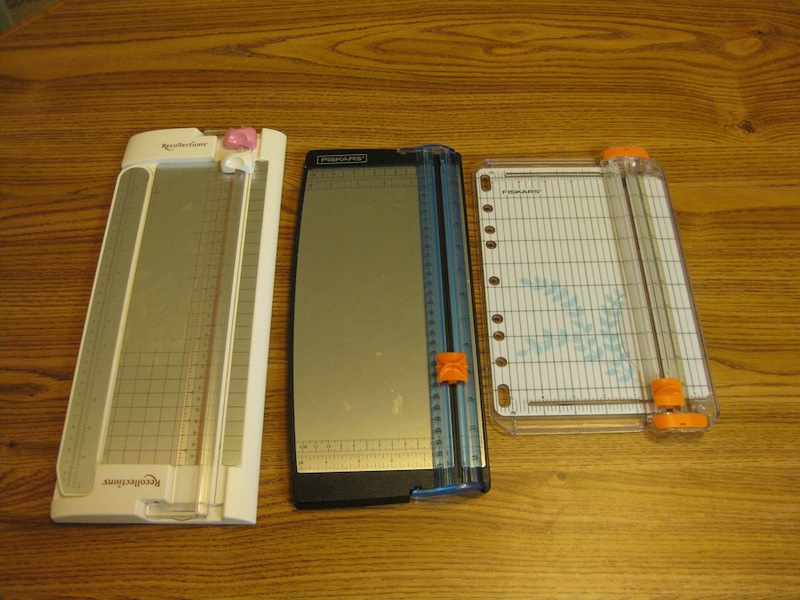 Get to know your paper trimmer. 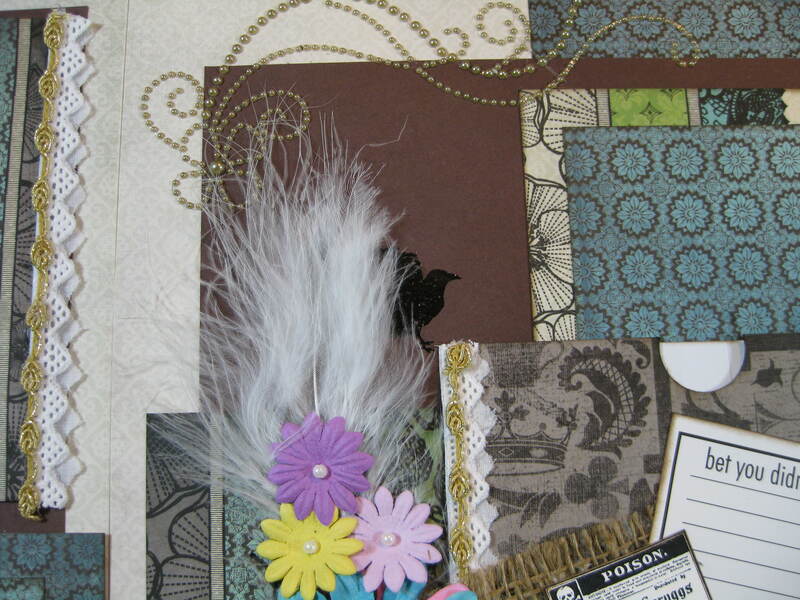 Most of all, if you are a beginning card maker and have limited tools, use what you have to create amazing things. I hope you enjoyed this video and learned something from it. I look forward to learning what you do. I have had this idea ramming around in my brain for several years. I have many excuses for not getting this posted or a video made….I’ll blame it on the time constraints of my old Day Job. Now seems like an excellent time to discuss this technique, with Thanksgiving and Christmas looming, and since I am no longer a truck driver. My poor kidneys can’t handle it any longer. Plus, Joe freaked out on my last trip out with him at the start of this month and he made the decision for me to get off the road. Okay, enough of that. Here is what you can do with a Sliding Blade Trimmer. 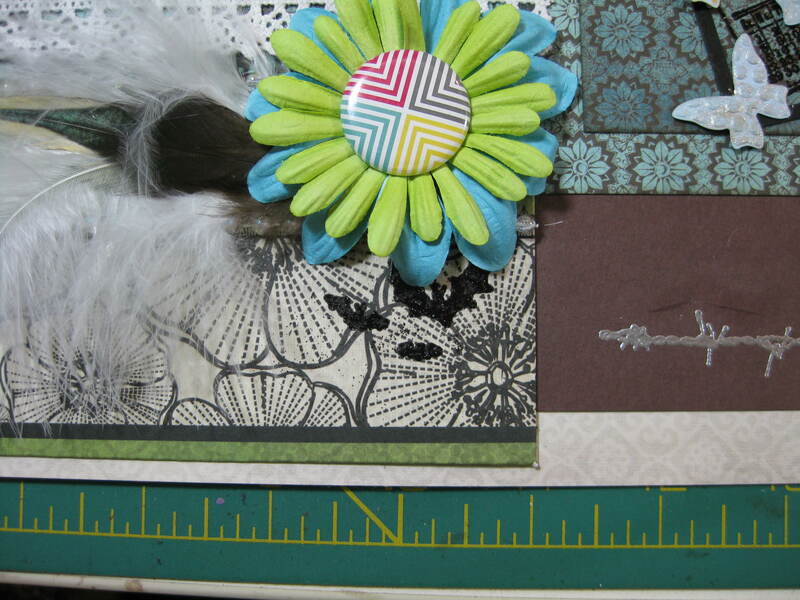 For a budding card maker, with limited room and finances, I can show you how to use your $25 Sliding Blade Trimmer to get this result. Mind you, the three examples I have for you are practice runs….because I had to reacquaint myself with the awesomeness of this essential paper tool. Have a look at the three samples I have here. You can see what can be accomplished with the Sliding Blade Trimmer, some stamps and ink, and some markers and glitter glue. You can’t see the 1/4 inch wide score marks on the Sample #2 because of my bad lighting. 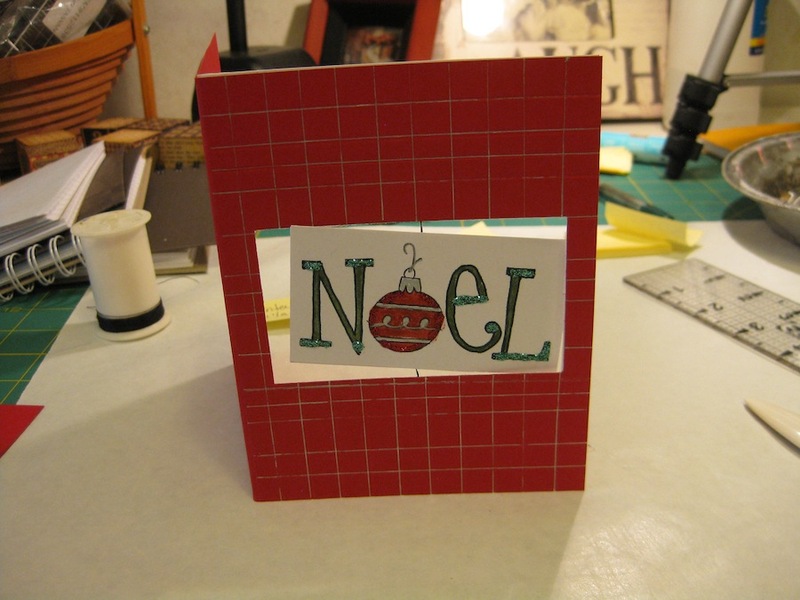 Not everyone can afford to purchase a $100 die cutting machine, the $25 to $50 cost of a Scor-Pal or a Martha Stewart Score Board, nor the cost of the dies at $15 to $25 a pop to make these kinds of cards. 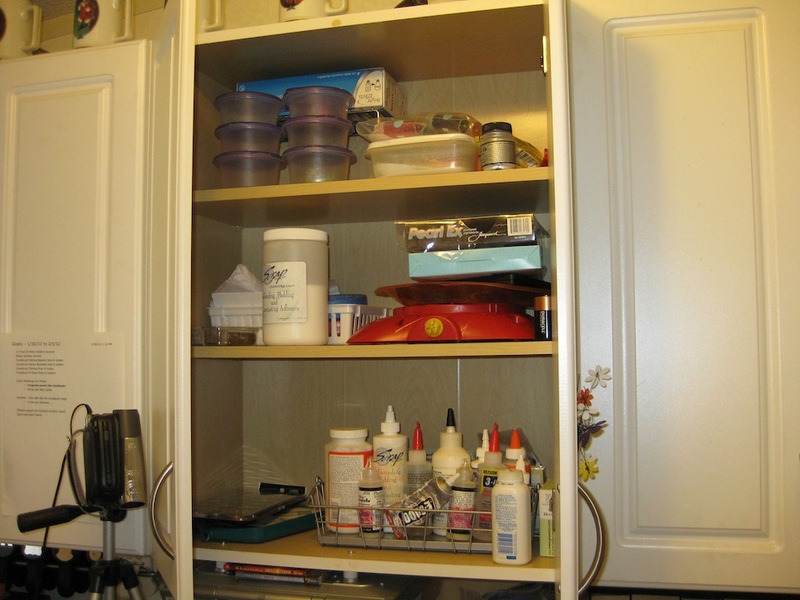 Some people may not have the space in their crafting areas to accommodate a large tool like a die cutting machine or the scoring board, nor the storage space for the dies. Cost may not be an issue with them, only the space. 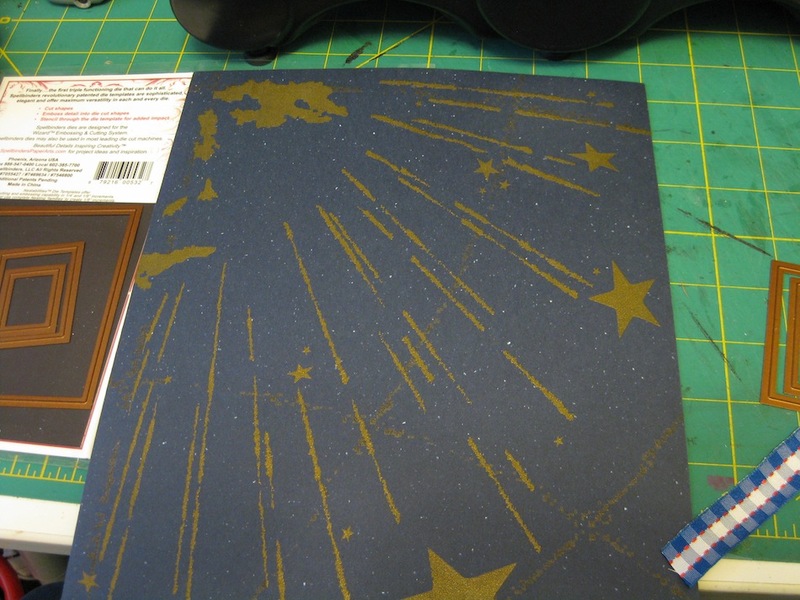 New paper artists may not want to invest in the die cutting machine, scoring board, nor the dies right now because they might think about waiting a little while to make such a financial commitment toward something they may not use much. Whichever the reason, all of them valid, you can achieve the same results with the Sliding Blade Trimmer. The sliding blade trimmer is like the “Swiss Army Knife” of the paper cutting tools. This trimmer is a true “Multi-Tasker”. 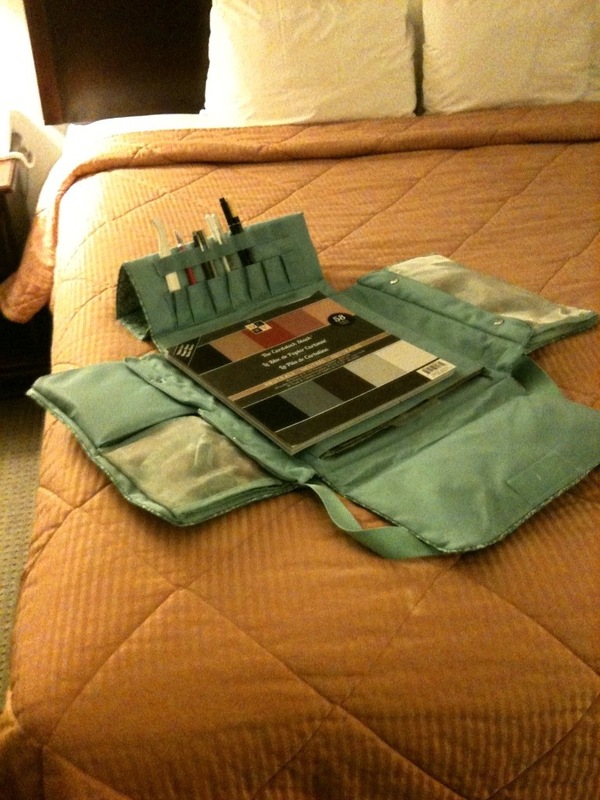 Many new paper artists pick this trimmer because of the low profile and easy portability. Plus, there are a ton of YouTube videos showcasing this paper trimmer as it cuts through card stock and text weight design paper with ease. 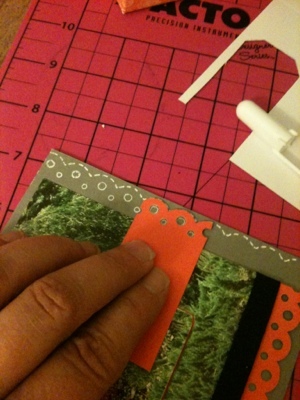 The cutting guide on the trimmer base is used, along with a bone folder, to score the papers. So, since everyone else uses it then it must be a good product. There are many drawbacks to using this paper trimmer exclusively. The one major problem is with the cutting blade. You have to purchase replacement blades for this trimmer. When the blade goes bad your paper cuts are no longer clean. The other drawback is the plastic guide the blade slides along. After changing the blade many times the guide stretches out a bit and your cuts are no longer true. They get a bit of a wobble in them. 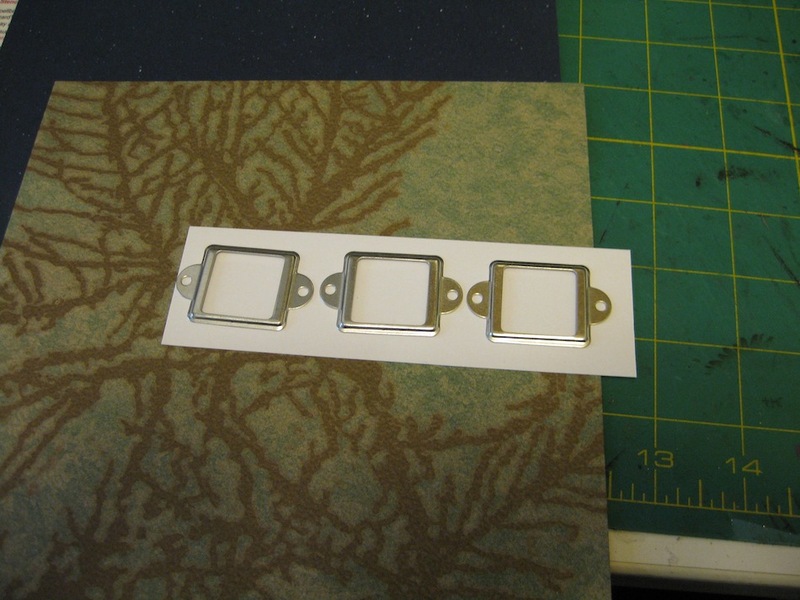 Over the next couple days I will take you through the steps to create Sample #1 so you get to know your paper trimmer and not beat yourself up about screwing up a perfectly good card base. 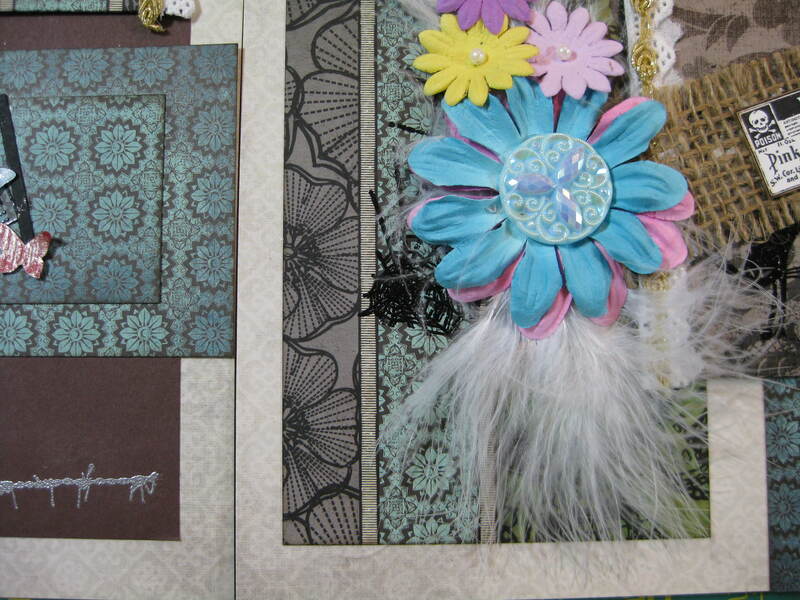 Once you master the Sample #1 you can then take on a regular card base to create your own design imagery. 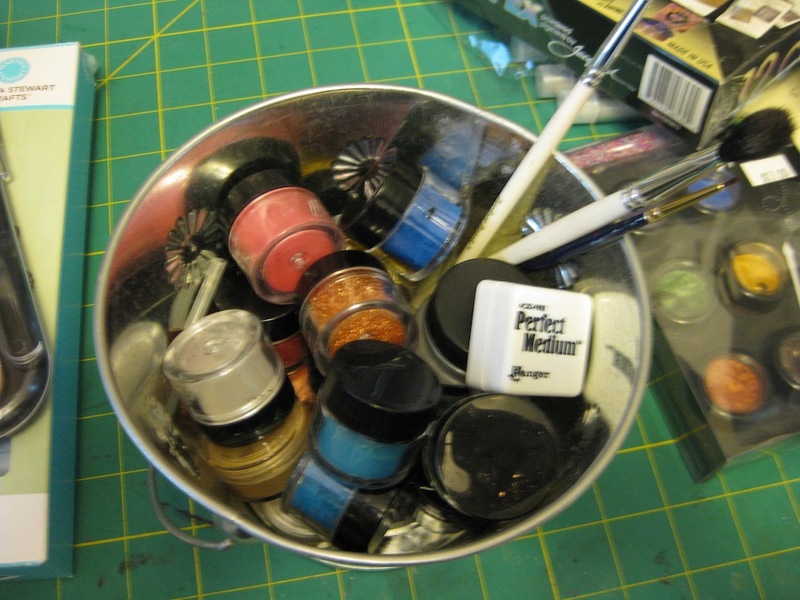 I need to warn you ahead of time….the posts for the Sample #1 item will be PHOTO HEAVY! That is why I am going to be splitting this up. I will be making a full video and hope to have it uploaded to YouTube by Saturday – November 22, 2014. 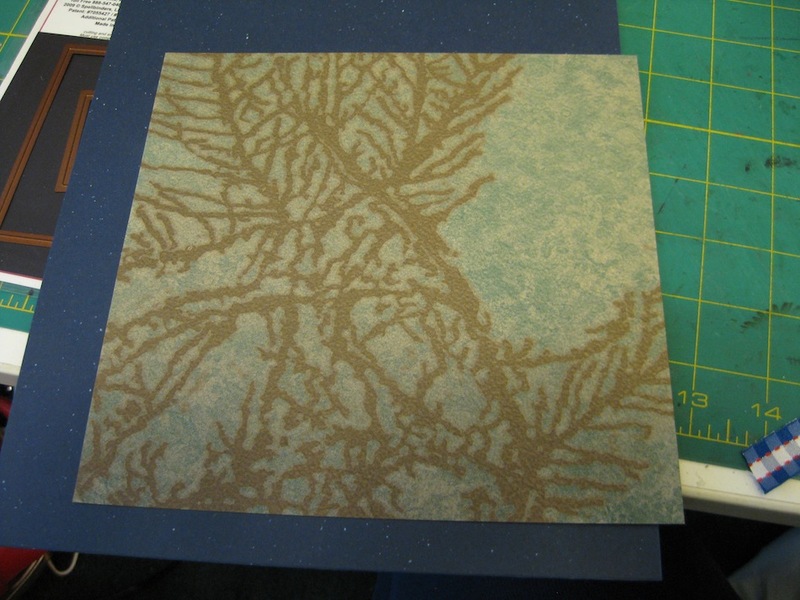 This technique can be used for many occasion greeting cards. 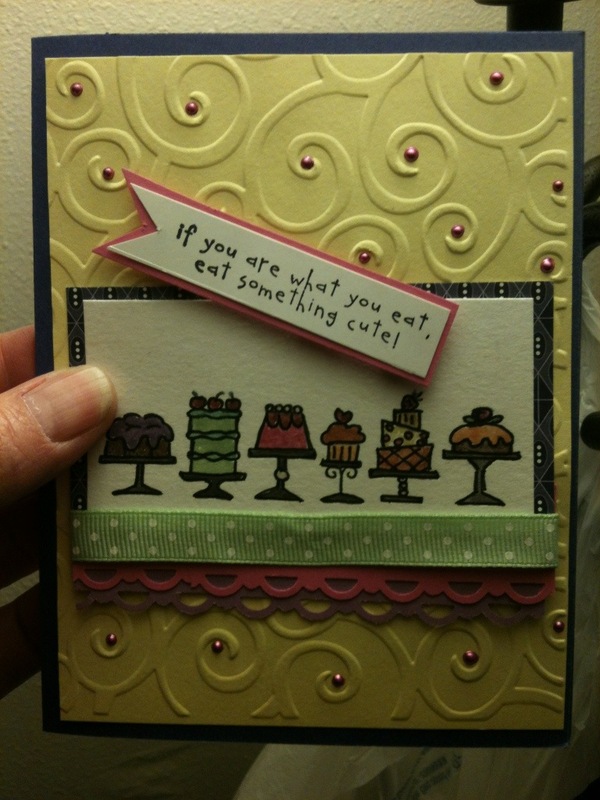 Use stamps featuring a birthday cake or a stack of presents for the birthday person. Use a stamp featuring a baby stroller to welcome the new little one into a family. Use a stamp that has a large sentiment, such as “Thank You” or “Congratulations”. 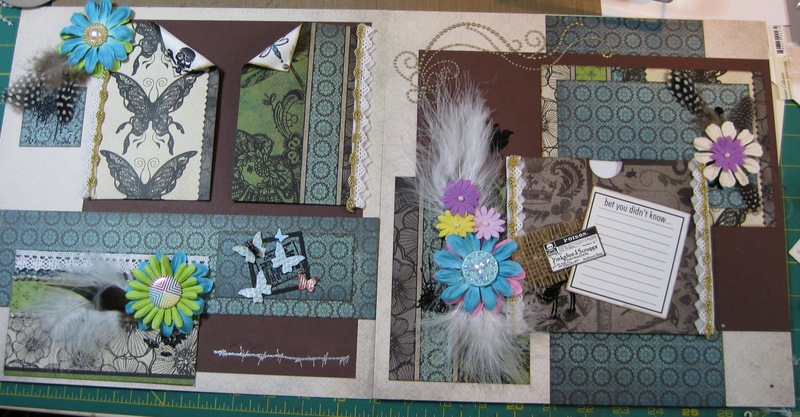 Make a feature window, such as in Sample #2, with a bouquet of flowers or a favorite scene you like to color for a “Get Well” or a “Sympathy” card. 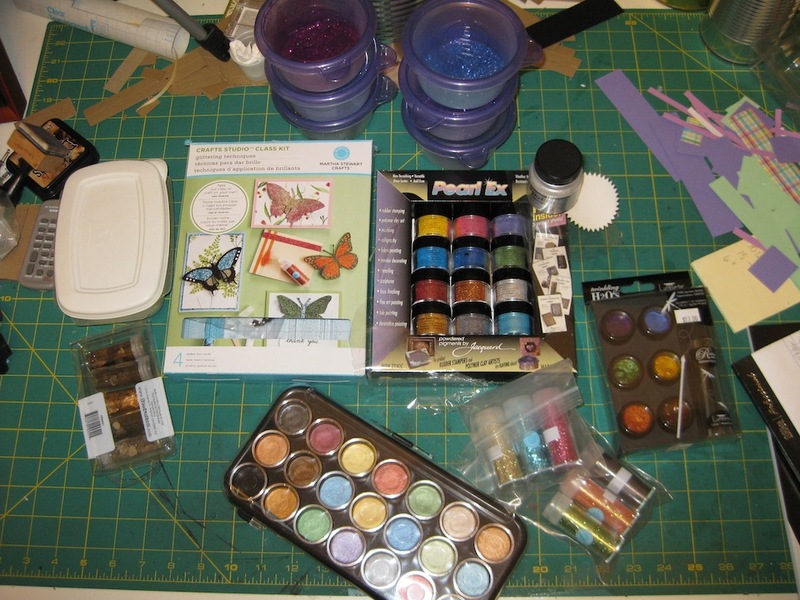 Your imagination, creativity, and card making supplies are all you need. Glitter. From Crap to Fab! With Joe out on the road and away from home I don’t have anyone to talk to. I also don’t have anyone to feed either. This gives me hours and hours of quiet time to do the things I need to do. I have to wrangle myself to keep me from getting my days and nights mixed up. It is too easy to take a nap in the afternoon then wind up being awake until 2 in the morning. I know. I have it really rough. Don’t I? 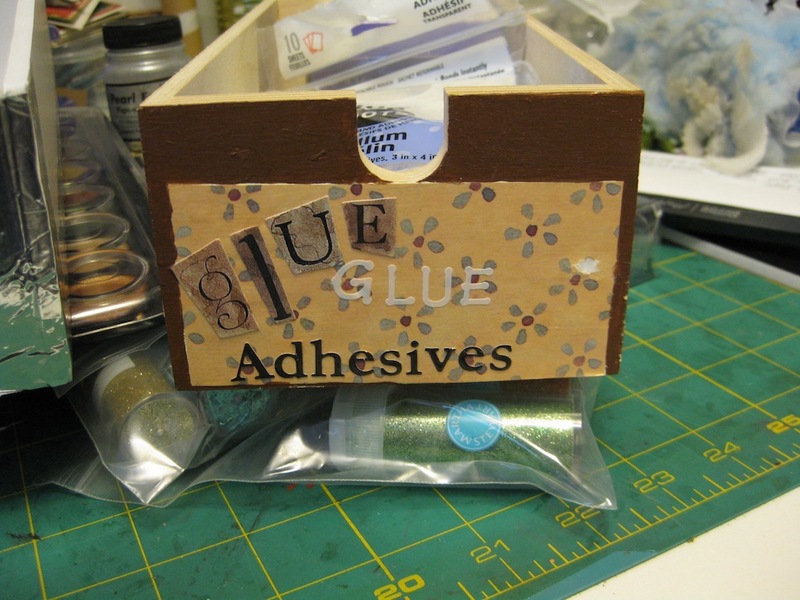 I am feeling pretty good about getting my adhesives all sorted and organized. It is time to move on to the next two shelves in the cabinet above my work table. This is still the “Way Before” photo. 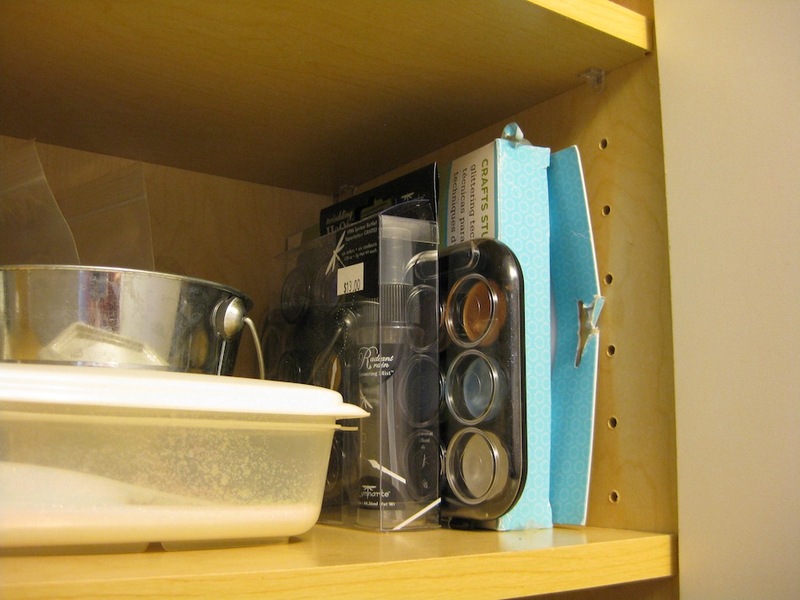 Pull everything out of the cupboard and take a look at what I have. Lay it out on my work table. I know I have more stuff somewhere in this room. Oh, yes. 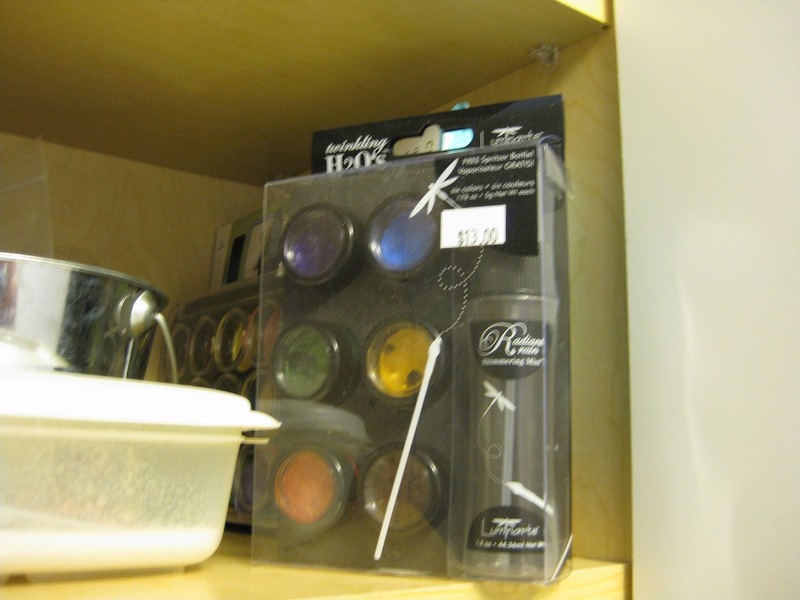 It is in the closet. Crapazoid. I have to work my way to the closet through a frightful obstacle course. 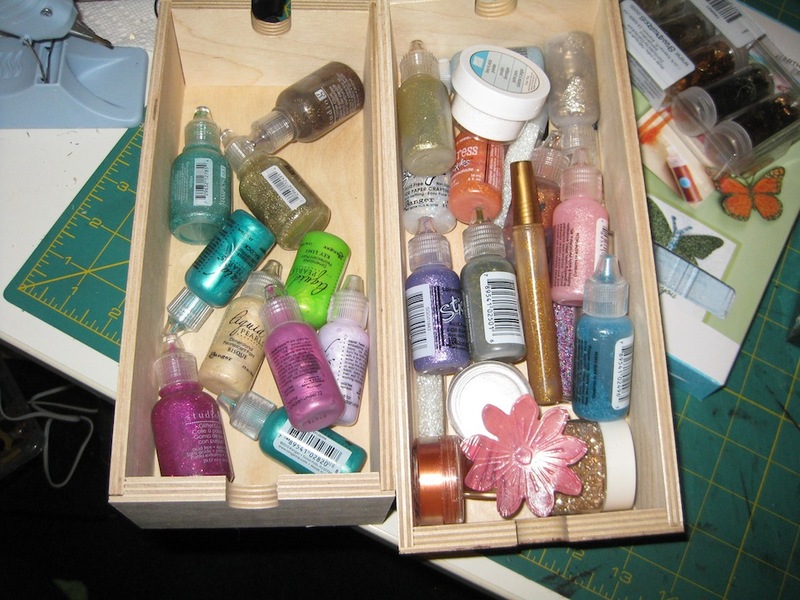 I succeeded in getting to the closet and pulling out the drawers with my glitter glue. Guess what I found while I was in the closet. I’ll give you three guesses and I bet you can get it in one. I got the adhesives dealt with quickly. And yes, I did make it safely through the obstacle course to return the now empty drawers back into the cube they came out of. 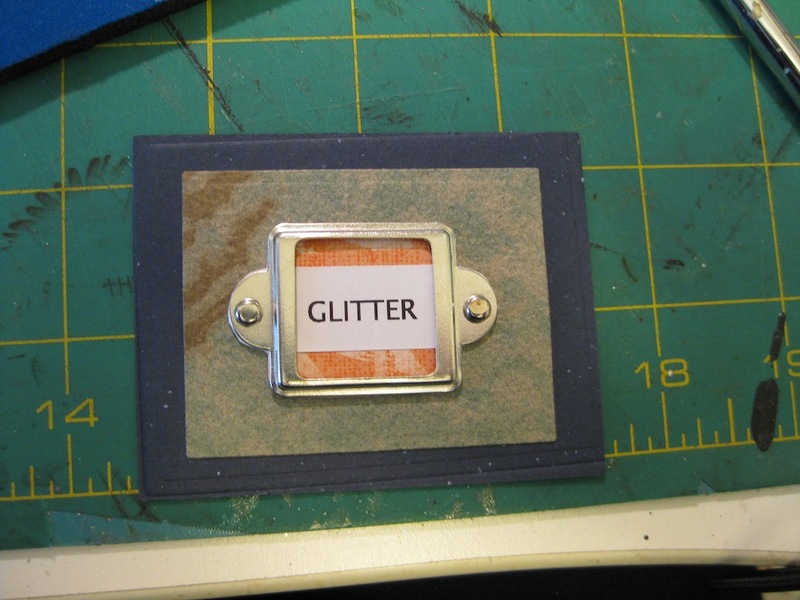 Since my supply of glitter and glitter glue is pretty small – for now. I will use some metal buckets I had purchased from Target about five years ago. 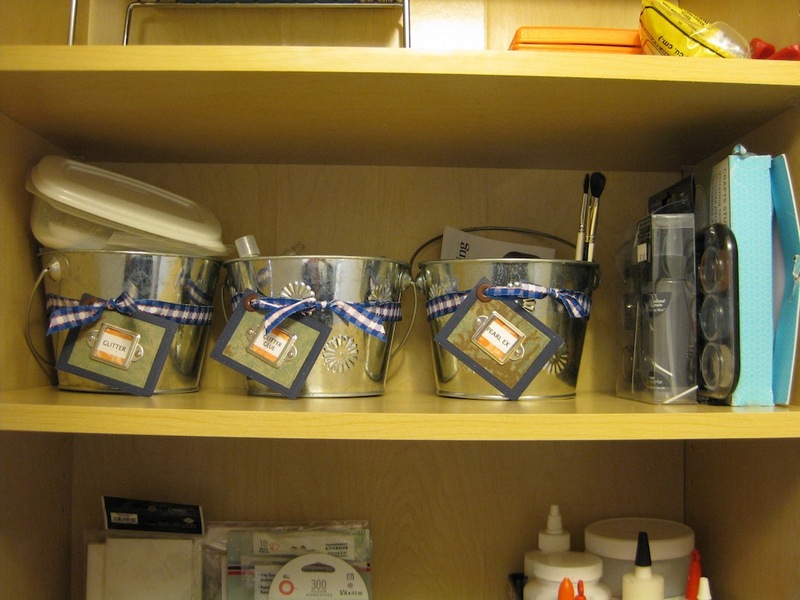 The buckets have been sitting on a shelf in another cabinet all this time. I think it is about time that I treat myself better and make my storage items look good. Usually I just chuck stuff and don’t concern myself with how it looks. Today that changes. 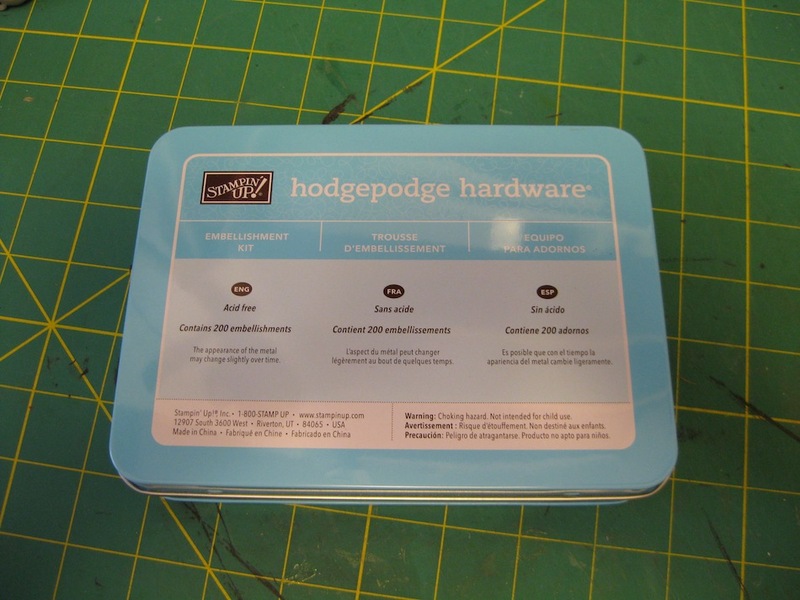 I will be digging through my Hodge Podge Hardware set I bought from Stampin’ Up! a long time ago. I think I’ll use the small square nameplate thingys. 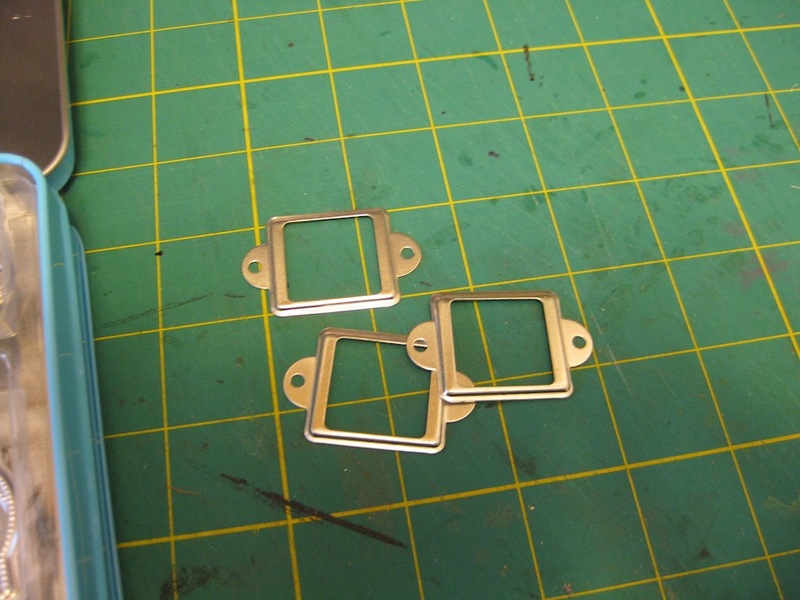 The small square ones will work well. 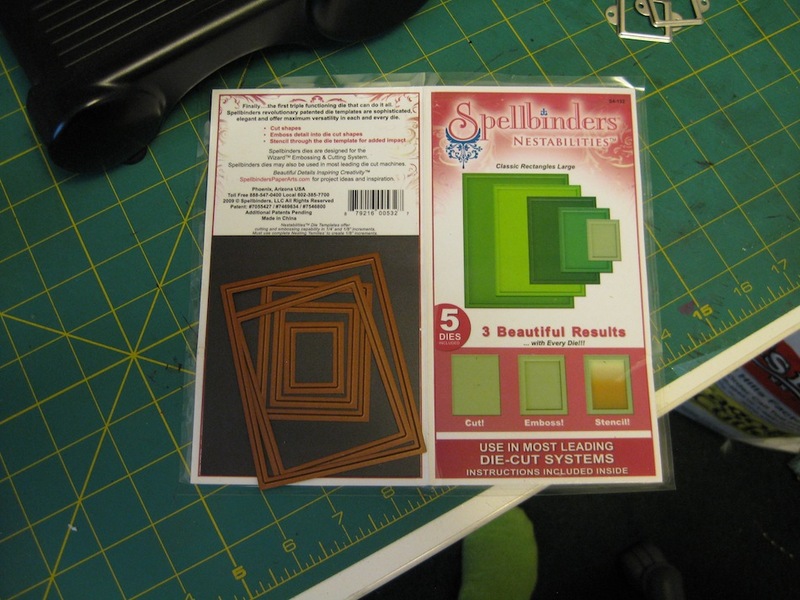 I think I will use some Spellbinder dies I have. That means another trip through the obstacle course for the dies and my Big Shot. I also need to choose a ribbon. I need some good stiff paper. That means I have to look through my stash of Club Scrap paper. 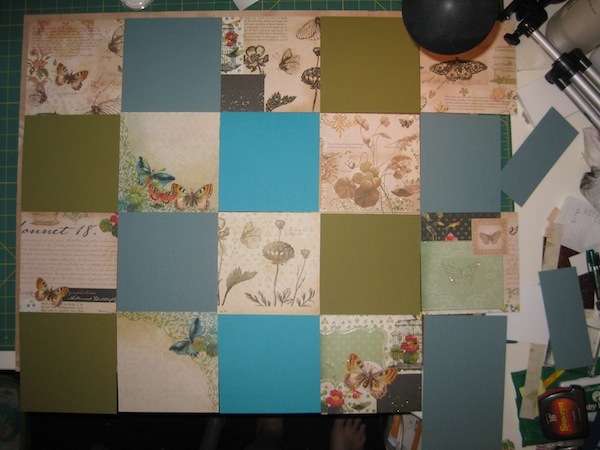 A dark blue piece and a light green piece. 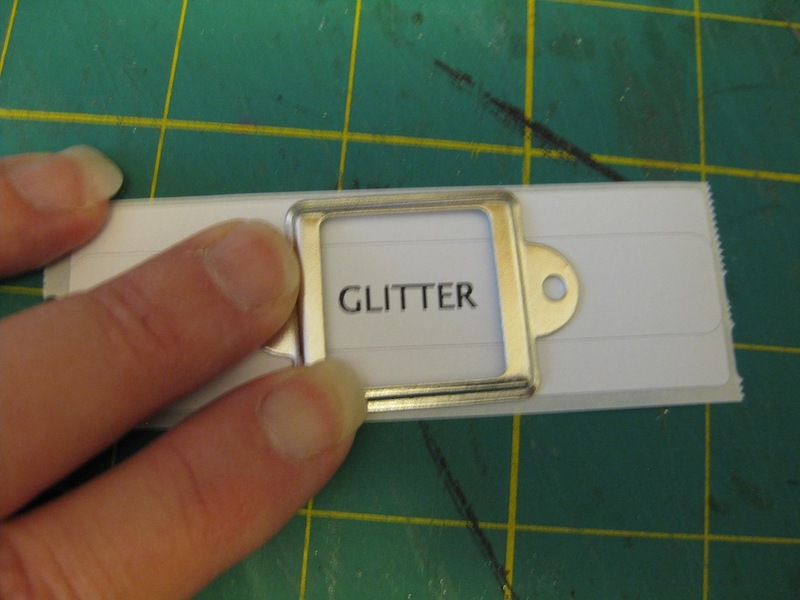 I also will need a scrap of paper to put behind the nameplate label thing-a-ma-bobs. Out to the living room where my Dymo Label Maker is and do a test to see if the words will fit in the little nameplate things. Get these labels put together. Punch a hole in the corner. Attach a grommet. 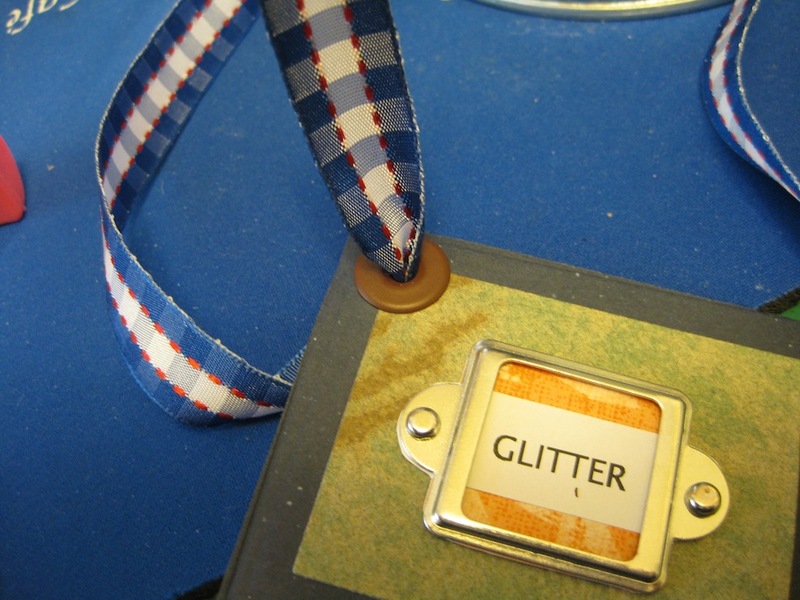 And attach the ribbon to the metal bucket. Just in case you decide to do this I have a “Heads Up” for you. 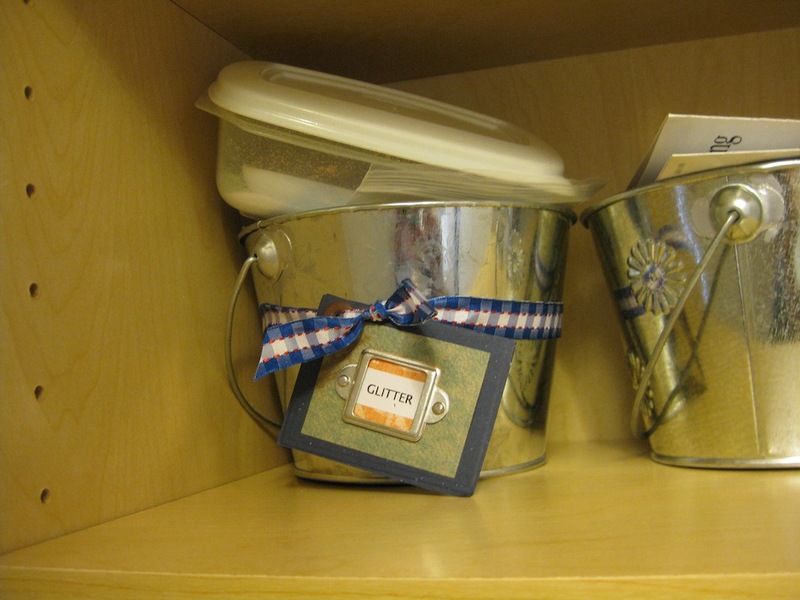 Use some little glue dots to hold your ribbon in place around the bucket. The ribbon wants to be dragged down by the weight of the label. Just sayin’. I have decided to let the Twinkling H2O’s stand at the shelf side. 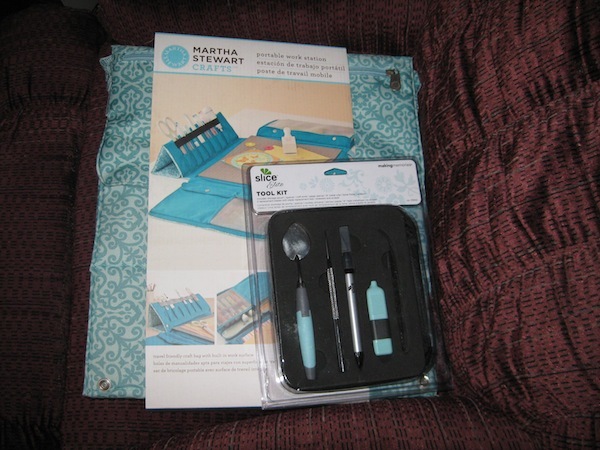 Also my glittery “No Name” water colors from Hobby Lobby, and my box from Martha Stewart the glitter came in. I have a confession to make. 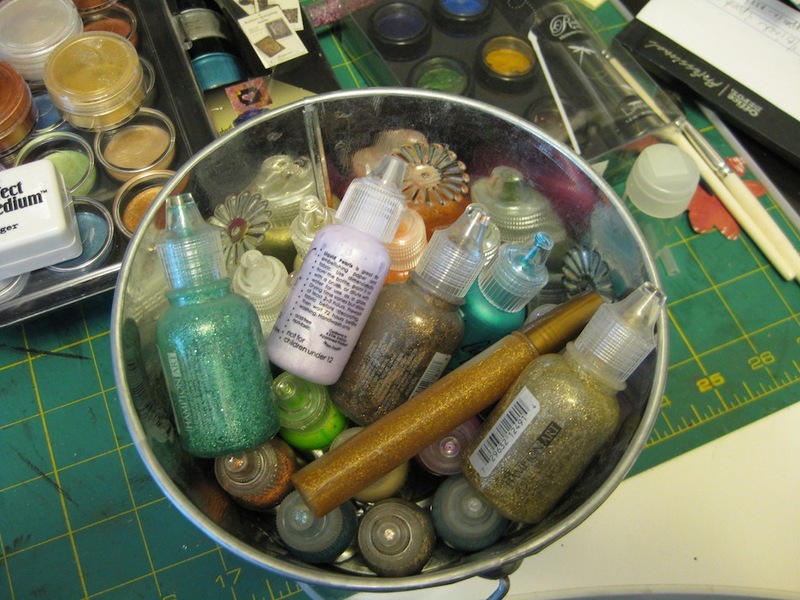 I didn’t have any small bottles for the multi colored glitter I had purchased long ago from Stampin’ Up! 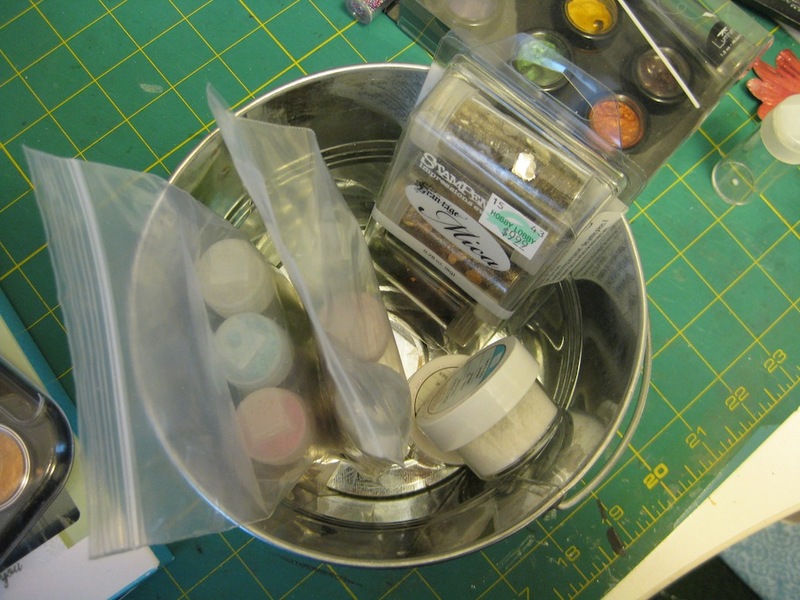 I didn’t want to fuss with the plastic containers so…..I tossed the stuff out. I know. Booooo – Hisssssss. These all rest very well against the side of the cabinet. Now….what you have been waiting for. I know, I know. I’ve drug it out long enough. So here it is. Ta Da! I’m very pleased with the result. 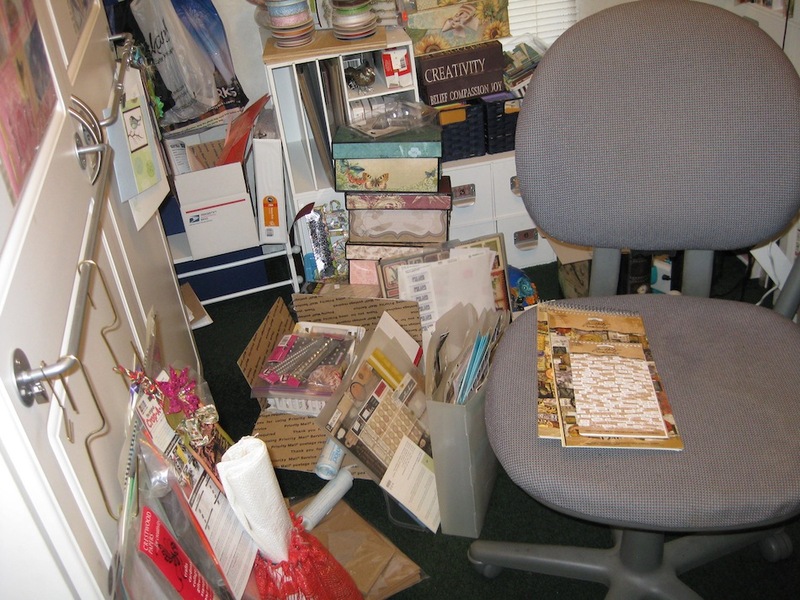 If you don’t hear from me in several days….I may have fallen and can’t get up from the CRAP on my floor! If you do see another one of these long winded posts you will know not to worry about me. Are you getting inspired to tackle an organizational project? 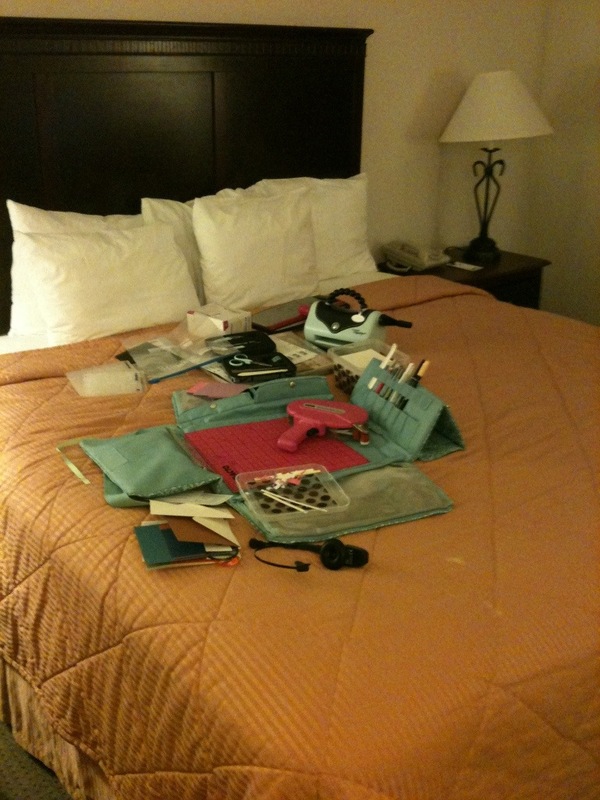 I’ve taken over the hotel bed with my crafty stuff. 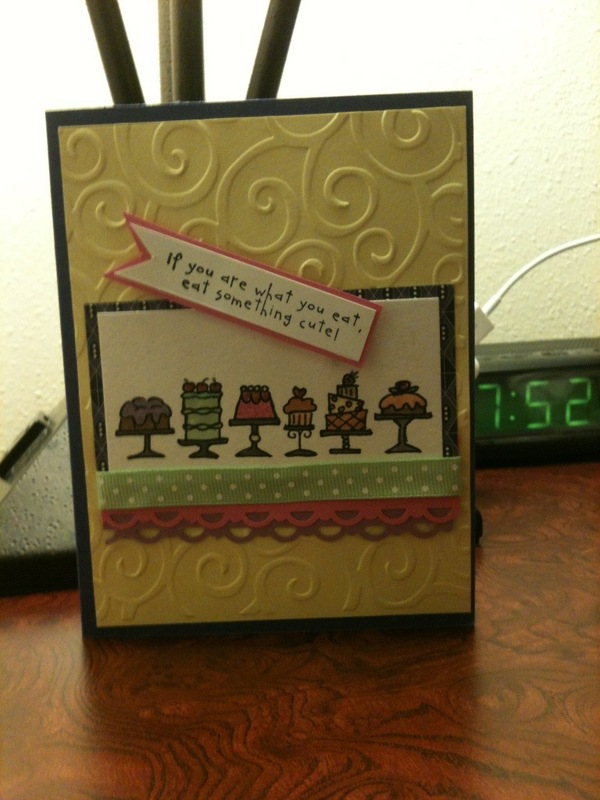 by Message In A Fold in Cards, Operation Write Home Tags: Birthday Bakery stamp set, Martha Stewart, portable work station, Scallop Border punch, Sizzix Texture Boutique, Stampin' Up! We have gone back to work today. 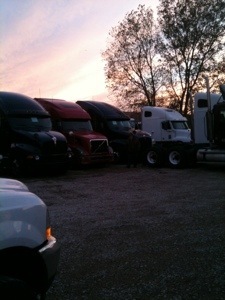 We arrived in Dallas, Texas this afternoon to pick up two trucks for Joe to take to Dixon, Illinois. 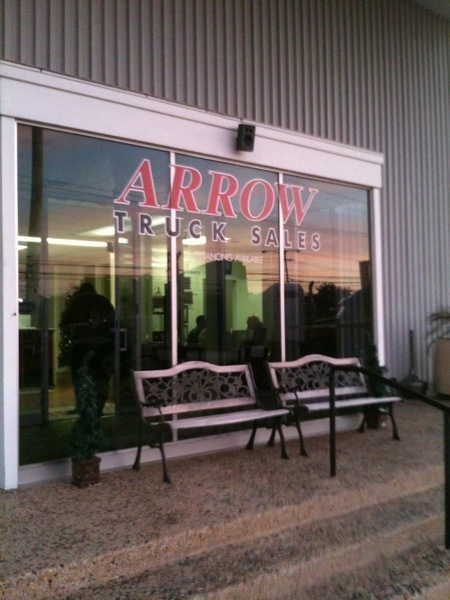 It was dusk by the time we got the keys. The lighting in here is not exactly bright but I could see just fine to create this mess. I think it also needs just a touch of Liquid Pearls by Ranger in Hydrangea. Guess it is time to clean up my mess so we can go to bed. Early and long day tomorrow. My Christmas present to Maureen. No peeking Maureen! A package came for me a couple days ago from Maureen Mathis. Her Christmas gift to me put a ginormous smile on my face and tears in my eyes. She was so thoughtful to give me something that I can take along with me on the road to do some creating in the hotel rooms we stay in nightly. A Slice tool kit, with storage pouch, that holds a spatula, pokey tool, craft knife, replacement blades, tweezers, a scraper, scissors, 6 inch ruler, and a bone folder. 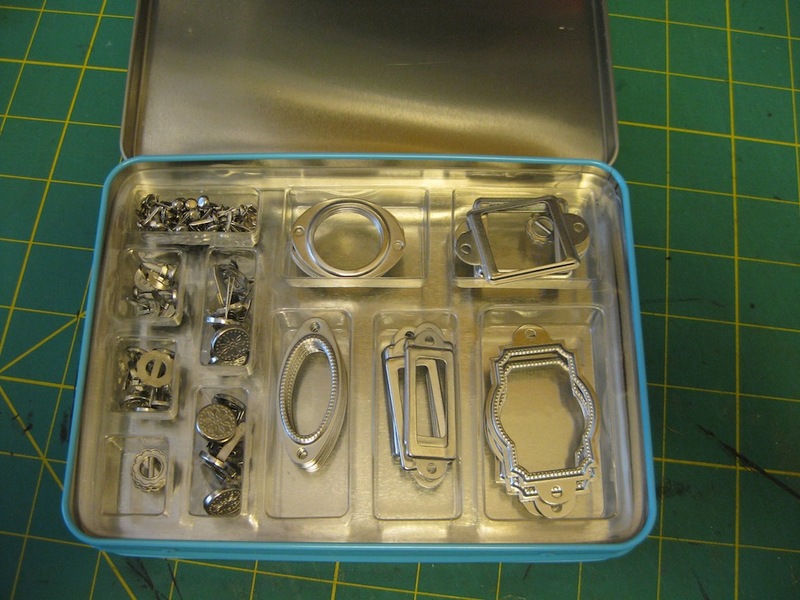 This is the coolest tool kit and will come in handy. 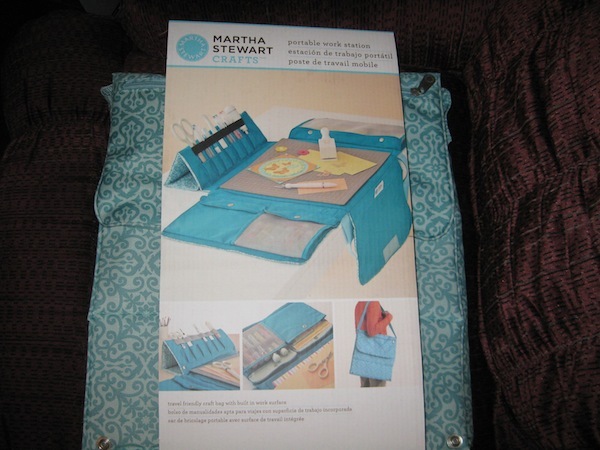 The Martha Stewart Portable Work Station is filled with pockets to hold many of the products I take along in my craft tote. 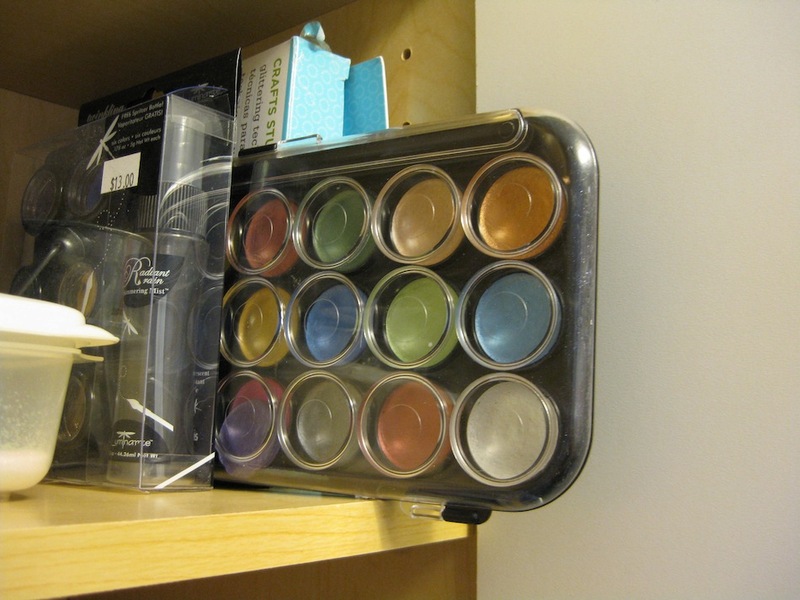 Currently I have to dig out all the stuff just to find the product I want to use. It is compact and has a long strap that will be easier for me to carry into the hotel room. Open it up and set it on the bed to begin creating. Thank you, so very much Maureen. I am so blessed to have you as my friend. I appreciate you and your generous heart. Now, Maureen, you have to stop reading this post. 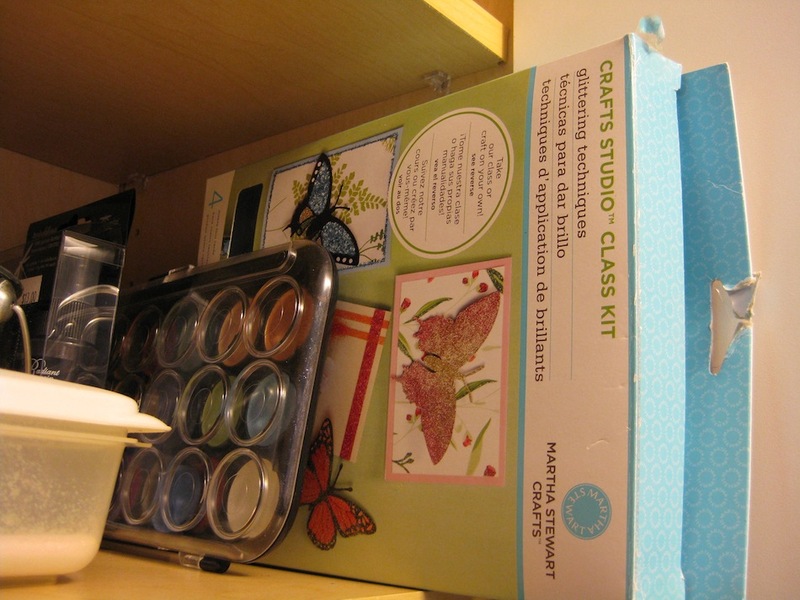 As many of you know, Maureen has a craft room she is totally pleased with. For those of you that haven’t seen it yet I have included her video tour – Part 1 – of her craft room so you can see where she creates. 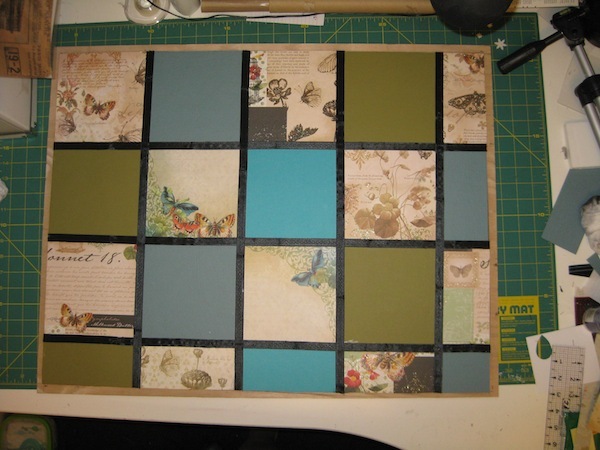 I am making her a bulletin board to go in her craft room. One she can attach card inspirations, family photos, favorite things she wants to have near or whatever she wants to put on it. I have one remaining frame and self healing cork attached to a board that fits the frame. 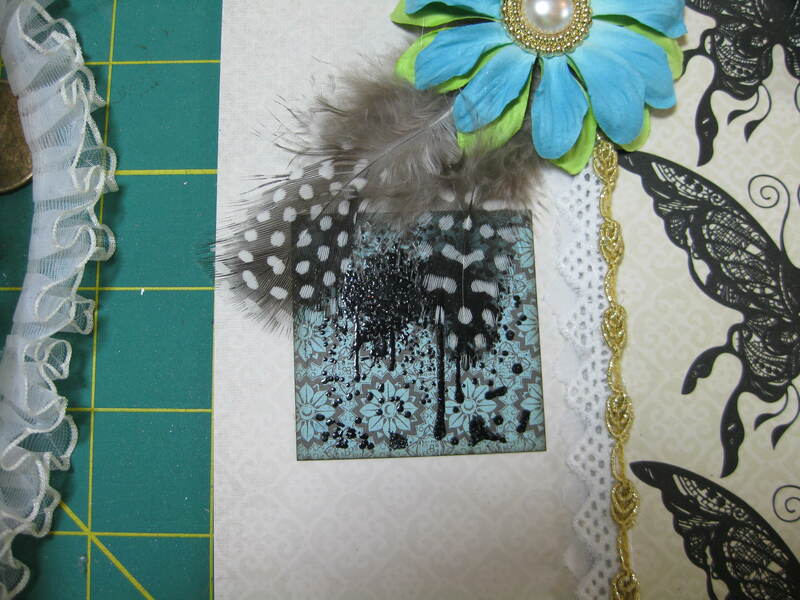 I am using DCWV’s Mariposa paper collection and some textured card stock from Club Scrap. 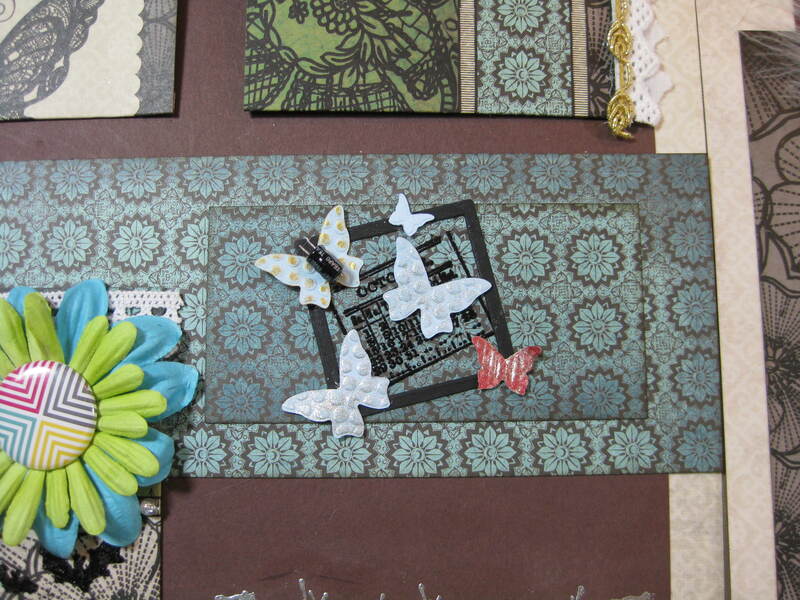 I have chosen the Mariposa papers because Maureen reminds me of a beautiful butterfly. She brings joy to the hearts of all she encounters and she leaves them with a huge smile on their faces. She has that effect on me anyway. I am so very blessed to have her as my friend. 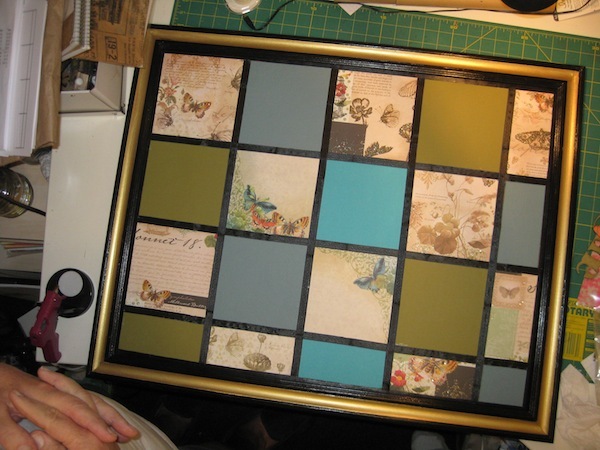 The papers are cut into 6″ x 6″ squares and placed over the cork. This is the “test fitting” process. 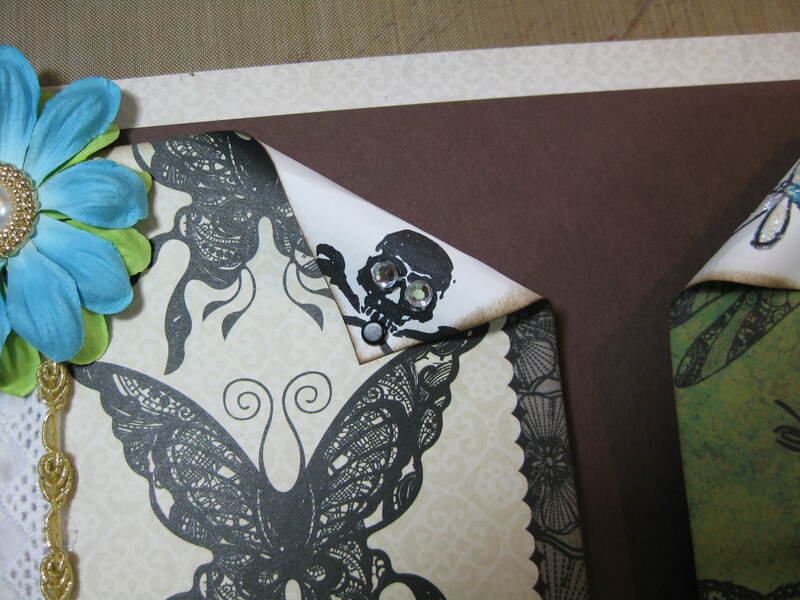 I wanted to make sure the colors of the plain card stock don’t clash with the butterfly papers. Once I was satisfied with the layout of the papers I glued them directly to the cork. 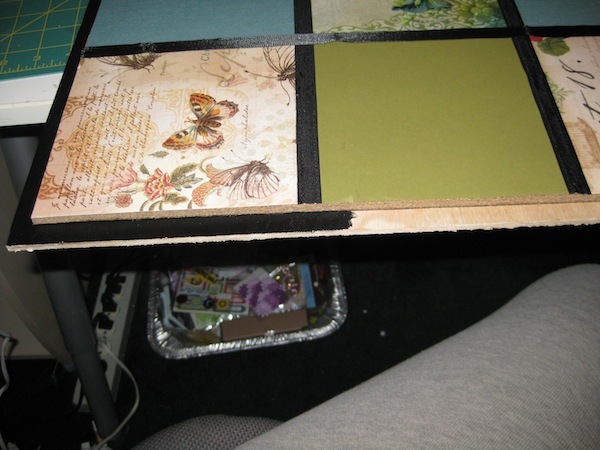 After sitting overnight under a home styled “press” to ensure the papers were properly seated and adhered I attached fabric hem tape to sort of frame each of the papers. I used fabric glue to adhere the hem tape to the paper. Once more the project went under my “press” to allow the hem tape to be securely adhered. You’re not still reading this are you Maureen? I began the painting process on the frame. 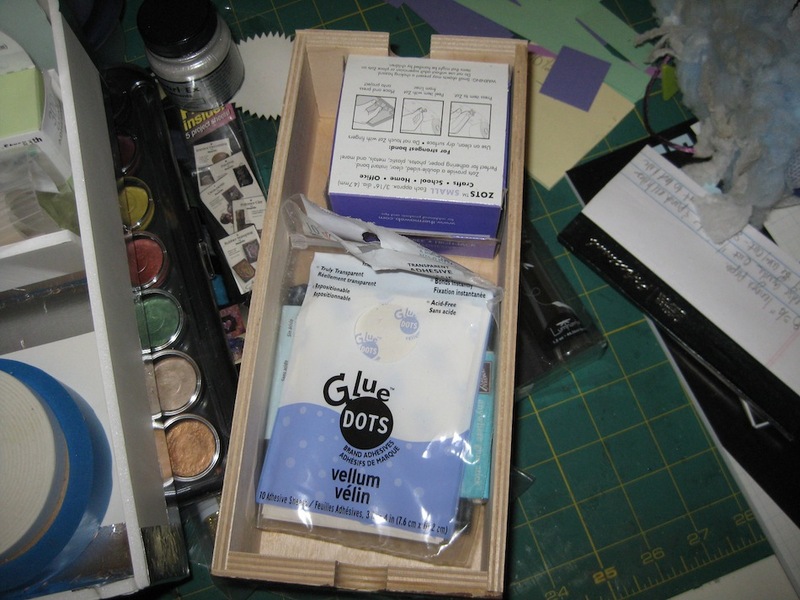 I am using acrylic paint you can pick up at any craft/hobby store. Black and gold are the colors I’ve chosen. 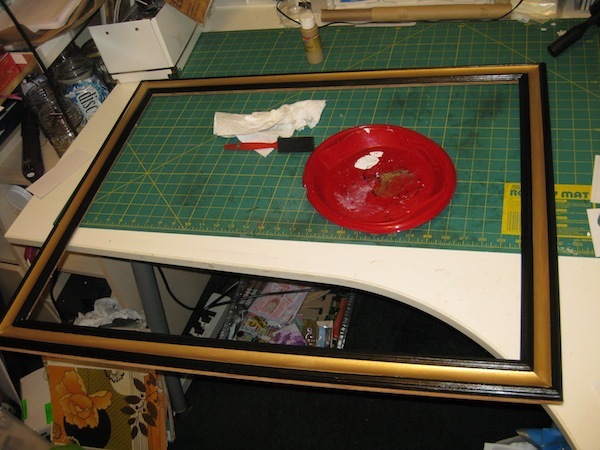 I taped around the inner part of the frame using a low tack painters tape to section off the area I wanted to paint. Once that was completed I set the frame aside for the paint to dry. 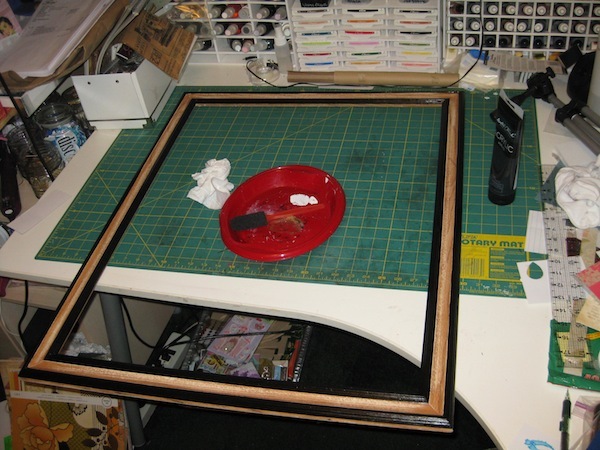 The inner section of the frame was taped to enable me to paint the outer edge with the black acrylic paint. Once that was finished I set the frame aside to dry once more. The painter’s tape was then applied to both of the black areas, leaving the center section open for me to apply the gold acrylic paint. 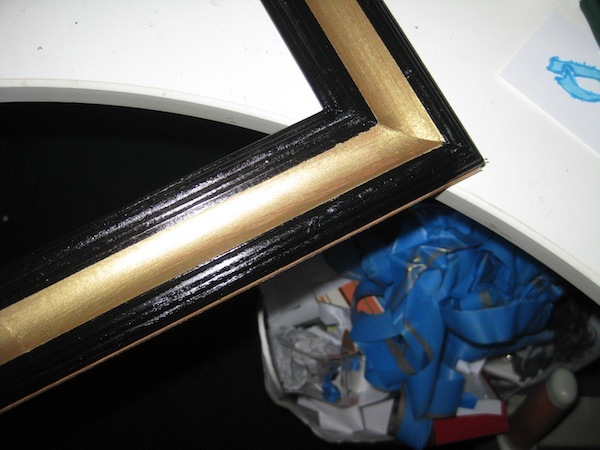 Here is a close up of the black and gold painted frame. Along with my piles of painter’s tape in my trash just below my table. After the cork board had dried of all the glue applications I had done it was time to paint the wooden edge of the insert. I also painted that with the black acrylic paint. This is the “test fitting” of the frame to the insert. Everything fits and I’m happy with how it is turning out. 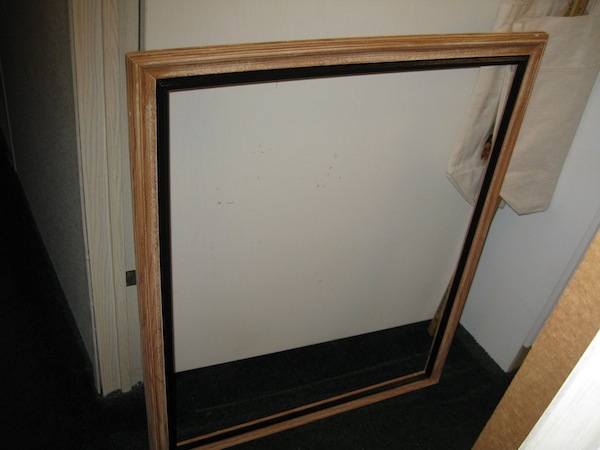 This project will be handed off to my master painter who will apply a coat of varnish to the frame. Once the varnish dries he will then attach the insert into the frame with glazier points to complete the assembly of this cork board. Once that part of this is completed then I will be getting out the much dreaded hot glue to attach flowers, pearls, feathers, and other types of embellishments before I send this off to Maureen. The rubber stamping inventory project will now continue while I await Joe’s part of this project to be finished. I hope I can get this finished for her to receive it by Christmas! 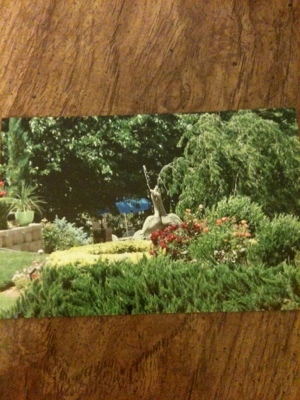 I wanted to see what a particular photo would look like on a card front with the center popped out. The photo I’m using today is of a fountain in Green River, Utah at the Tamarask Inn. I wanted the fountain part stepped out from the flat photo surface. 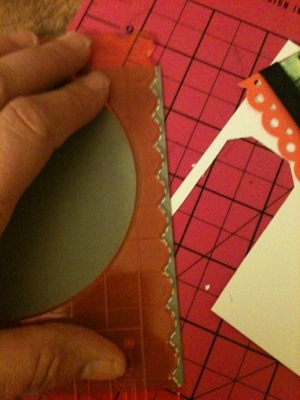 Using the rectangular shape template from Fiskars I set it up then cut the area out using my craft knife. 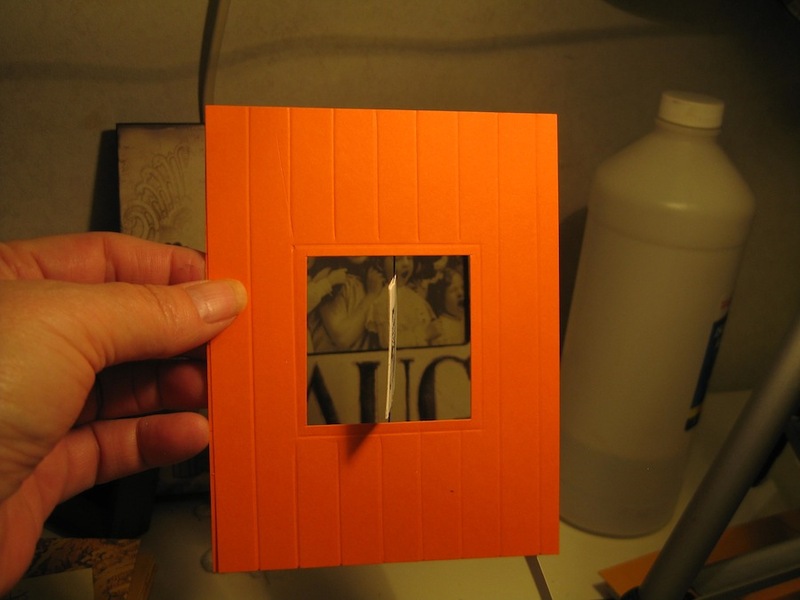 Behind the hole I cut out I placed a piece of orange textured cardstock from Colorbök. 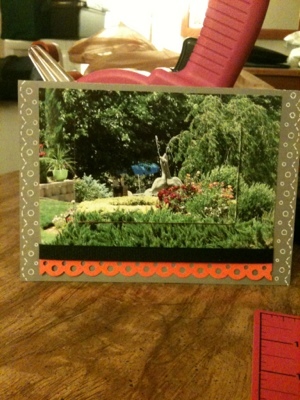 I cut another piece of the orange card stock and used my Martha Stewart punch on the edge then adhered it behind the photo. A piece of black Offray gross grain ribbon was placed at the bottom of the photo and above the scalloped punched edge. 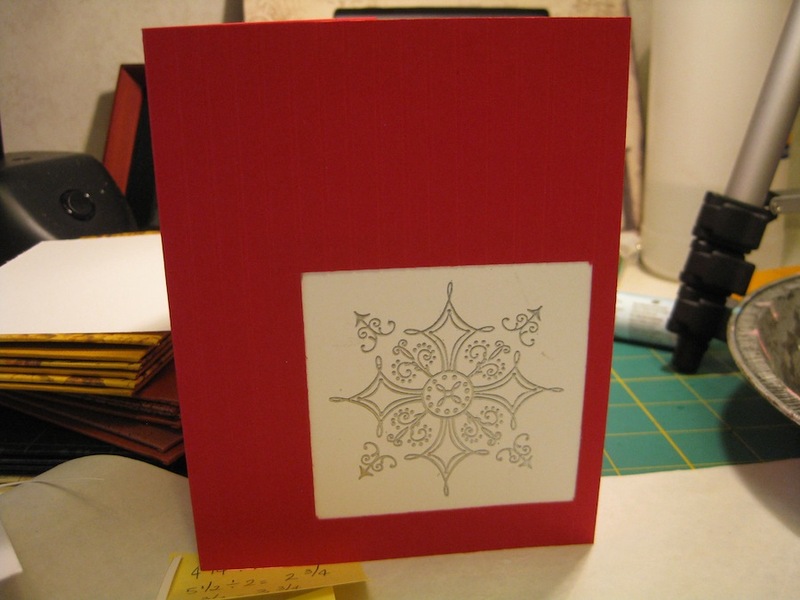 Using the small scallop edge on one of the Fiskar templates and a white gel pen I made faux stitching lines along the templates edge on both sides of the card front. A happy find was a scrap of the Martha Stewart punched paper fit perfectly in the Fiskars scallops. 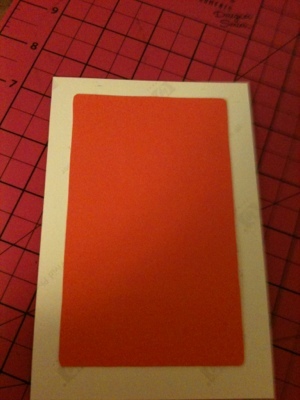 I traced the punched holes onto the card front to match the punched edges. 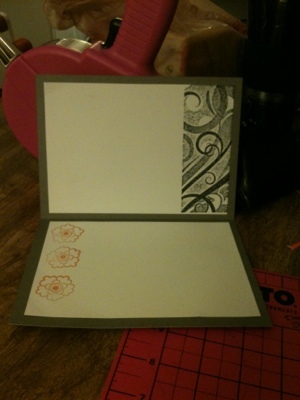 After I had stamped three flowers from one of the Studio G stamps onto white card stock I realized I already had a piece in there from my oopsey yesterday in making the Triptych card. 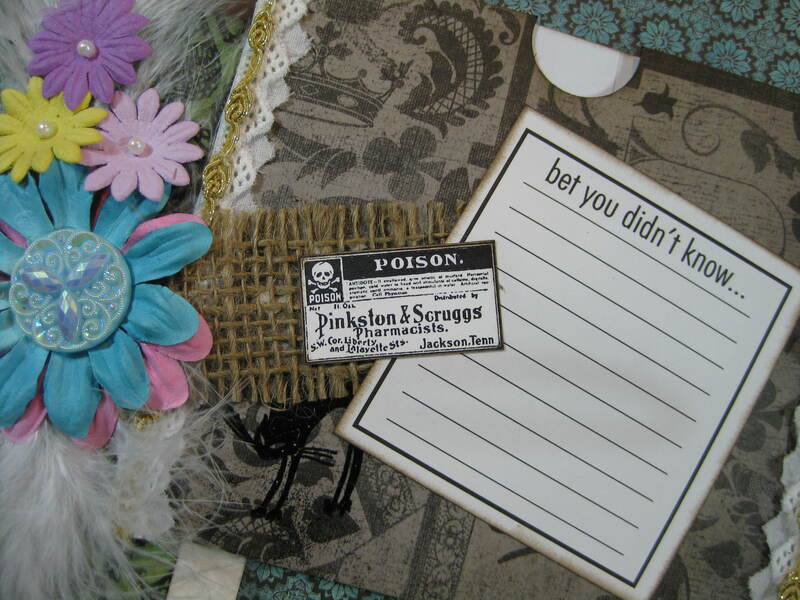 The 5″ x 7″ I originally intended to use was too small.